A Segway is a two-wheeled, self-balancing, battery-powered electric vehicle. How fast is a Segway? Our vehicles can travel at speeds of up to 20km/h / 12.5mph. Do you provide training & safety equipment? Yes we certainly do. Around 95% of our guests have never driven a Segway. Firstly we provide each rider with a safety helmet, hi-visibiity jacket, safety gloves, elbow & knee pads. Then before the tour starts we provide extensive training in a controlled and safe environment where each rider is instructed on how to use the Segway whilst also practising on the vehicle until everyone feels 100% comfortable to depart on the tour. It takes on average 10 to 20 mins for new users to feel confident to start the tour as they soon come to realise that it is incredibly easy and intuitive to drive a Segway! Rider restrictions - Age, Weight, etc. To ride a Segway on one of our tours you will have to meet the following requirements: - Riders must be over 100 pounds and less than 250 pounds (46-113 Kilos) - Riders must be able to easily and quickly step on and off the Segway without assistance, which requires physical abilities similar to climbing and descending stairs without any assistance or use of a handrail. - You must be physically self-sufficient. The Segway is not appropriate for those weighing under 100 pounds (46 kg) or over 250 pounds ( 113kg). It can be ridden by people from ages 16 to approx. 70. For participants from 16 to 17 years of age we require a waiver to be signed by a legal guardian. IMPORTANT: Pregnant women and those under the influence of drugs or alcohol you will not be be permitted to ride a Segway on our tours . Mobile phone & camera use whilst riding the Segway? The use of mobile phones, pagers, PDAs, cameras, iPhones, text messaging devices, and other mobile communication devices are prohibited while operating the Segway. We will however have stops along the tour where you can dismount the Segway and use such devices as required. Yes, you will receive a "booking confirmation" e-mail with all of the necessary details of your booking, which includes: Tour Time, Date, Location, Group Size, & Full Cost Paid. Please bring a printed copy of this as confirmation on the day of the tour. If I wish to cancel will I be refunded? If you cancel 72 hours before your tour is due to depart you will be refunded your full amount less a 5% credit card processing fee. If you cancel with less than 72 hours until your tour is due to depart you will not be refunded for the cancellation. The tour will proceed rain or sunshine. No refunds will be made for missed airplanes, buses, trains, late arrivals etc. and arriving late (Over 15 -20 minutes) without contacting us to inform us of the issue may also see your tour booking being unavailable or offered to another party of customers. If in doubt or you need further clarification on any of the above please don't hesitate to contact us. Advance purchase is strongly recommended, as tours often sell out quickly. To maximize your chance of getting the day and time you prefer, please book well in advance. You can do this online or over the phone using only Visa, Mastercard or American Express. What weather conditions do you travel in? We obviously love to run our tours in sunny weather but even in wet conditions it is never a cause for us to cancel the tour as a Segway is also safe to ride in such conditions. If it starts to rain during the tour you will be provided with ponchos. In the case of very heavy rain, wind, snow, or icy conditions (during the winter) we may notify you in advance that we aim to cancel the tour and either provide you with a full refund, schedule your tour at an alternative time and date, or issue you with a voucher to the value of your purchase which will be valid for a full year from such date, which ever is to your satisfaction. Will we enter all of the tour attractions such as museums etc? Whilst we will stop at the tour attractions to take in the views and snap some photos, we will not enter all of the tour attractions as there are constraints such as limited tour time and cost of entry to locations. Please see your tour itinerary for exact tour attractions that we are currently entering. Can I hire a Segway to take a self-guided tour? No, unfortunately not. 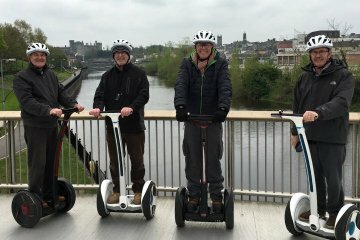 We provide all our Segway tours with a local tour guide included.